This small skipper is common and is widespread in distribution across Singapore. It usually flies close to the ground flitting from flower to flower as it feeds. The caterpillar host plants are mainly grasses, including the common urban Cow Grass (Axonopus compressus) that covers very much of our urban turfed areas like roadside grass verges and school fields. The butterfly is dark brown above and reddish brown on the underside of the wings, with a series of white spots on both wings. 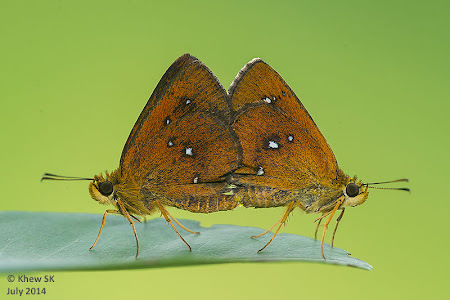 This mating pair of Chestnut Bob was photographed last weekend at the Butterfly Hill on Pulau Ubin.